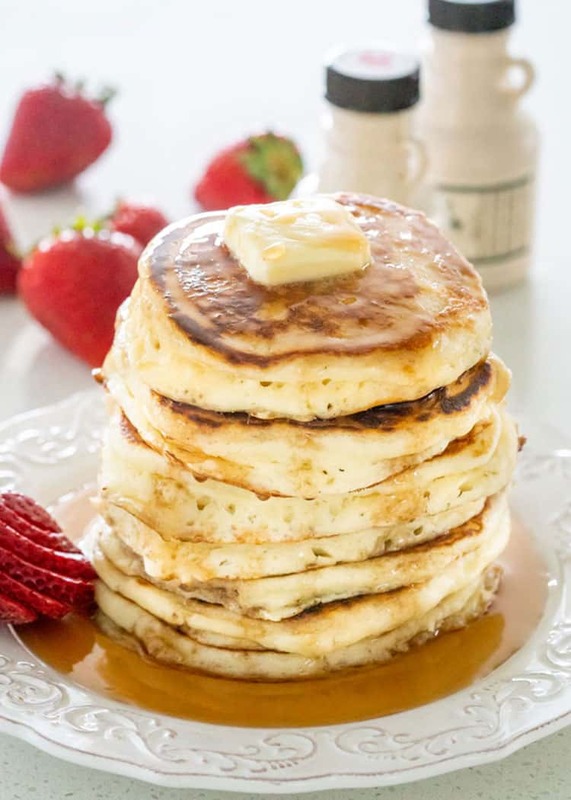 Everyone needs an easy no fail recipe for Classic Pancakes in their cooking repertoire! 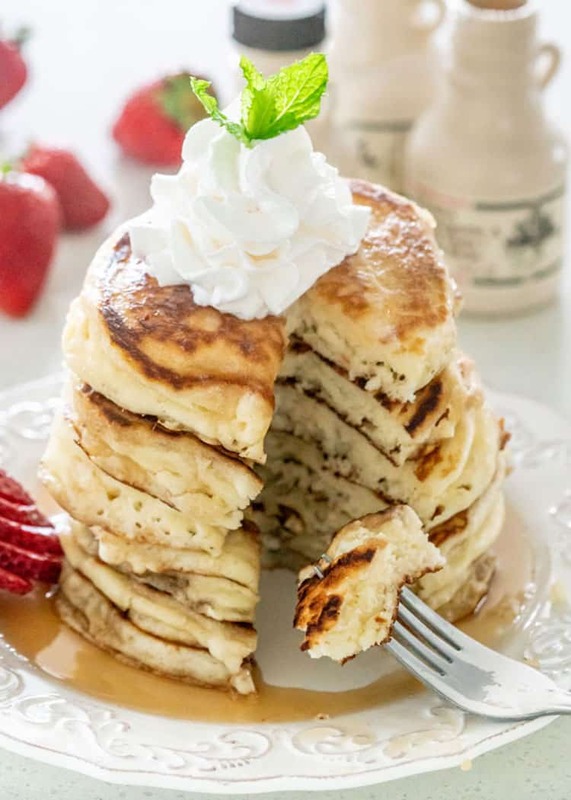 These are so delicious and perfect for a weekend breakfast! This pancake recipe couldn’t get any easier, and it’s about as basic and classic as a pancake recipe could go. Not too sweet, but perfectly fluffy, moist, soft and super delicious. 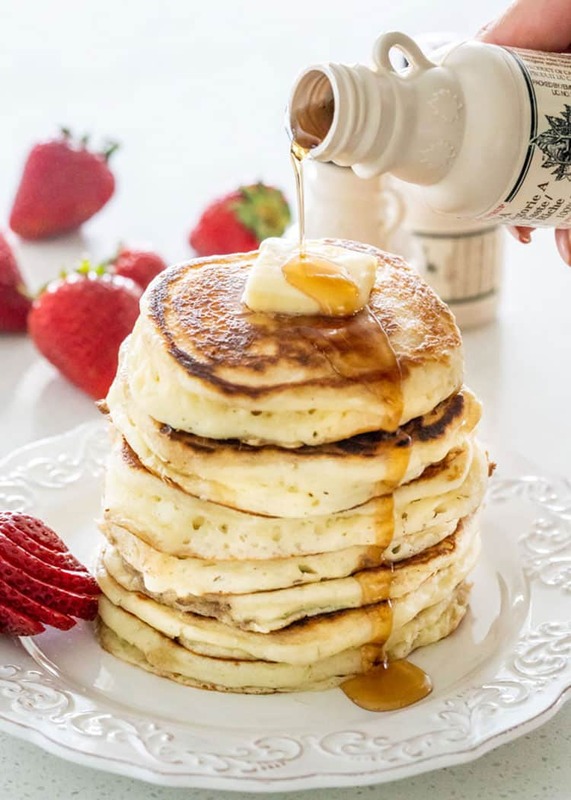 After all, pancakes are mostly about the toppings, and my favorite topping is and always will be maple syrup for pancakes with a dollop of whipped cream. Don’t over mix your batter, you want that batter light and fluffy and you just want to mix it until most of the big lumps are gone. Make sure your skillet or griddle is hot before cooking your pancakes. Preheat it over medium heat, then lower the heat down to low-medium heat and wait a couple minutes before adding butter and cooking your pancakes. Don’t cook your pancakes over high heat, medium low heat is what you’re looking for. Be patient, wait for the bubbles to start forming on top before flipping. As I already said, I always love mine plain with just a good pure maple syrup and a dollop of whipped cream. Other toppings could be honey, agave syrup, chocolate syrup, or strawberry syrup. Try adding fresh fruit like strawberries, raspberries, blueberries or bananas. In a bowl combine together the flour, baking powder, salt and sugar. Make a well in the center and add the milk, egg and melted butter. Whisk until most of the big lumps are gone, but do not over mix. Heat a non stick skillet over medium heat. Brush with a little bit of butter, about 1/2 tsp, or swirl it around to evenly coat the bottom of the skillet. Pour about 1/4 cup of batter into the middle of the skillet. Use a ice cream scoop or a smaller ladle. Spread the batter around a bit to make sure it forms a circle. Cook for about 30 seconds or until bubbles start to form, then flip and cook on the other side until golden brown. Transfer to a plate and keep warm while repeating with remaining batter, until done. 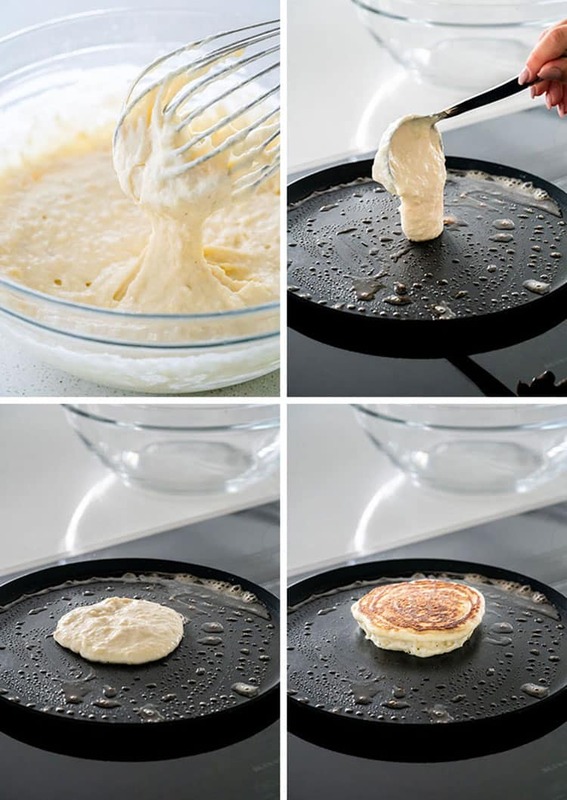 Should yield anywhere from 8 to 12 pancakes, depending on size of pancake. Nutritional information assumes this recipe yields 8 pancakes. Please keep in mind that nutritional information is a rough estimate and can vary greatly based on products used. This is the recipe I’ve been making for over 30 plus years. It always turns out and my kids and husband love it. Thanks for putting this on. Since kids are on their own, we only have this once in a while. So happy to hear this! Glad you guys like it! Love this recipe! Easy to make and yummy! 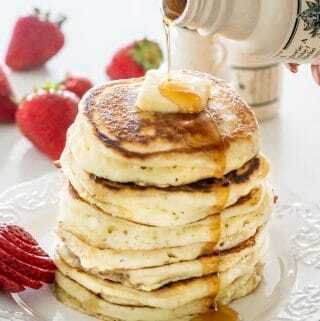 Hi, been looking for a good basic pancake recipe. so thank you! Just wondering… what is the pan you are using in the photo to cook them? Looks interesting.I usually use a non stick, but don’t get the colour you did.